The incident was said to have happened in the tunnel after Barnsley’s 4-2 League One victory which took them back into second place. Tempers erupted in front of the dugouts after the game with Fleetwood staff seemingly upset by Barnsley media staff videoing events. But the alleged assault was said to have happened on the way back to the dressing rooms. Neither club would comment on the situation, initially, and members of the media were escorted away from behind the stadium where the Fleetwood coach was waiting for it’s players and staff. A Barnsley FC statement, issued shortly after 6pm, read: “The Club can confirm there was an alleged incident in the tunnel area that took place following the conclusion of today’s match, which South Yorkshire police are currently investigating. On the pitch, Barnsley made it 25 league games unbeaten at Oakwell to continue their pursuit of the second automatic promotion place. The thrilling victory in front of 11,243 fans, took the Reds two points clear back into second as Sunderland, who have a game in hand, suffered a remarkable 5-4 home defeat to Coventry City. Portsmouth, too, have a game in hand and are on the same points as the Black Cats. Recalled attacking German midfield man Mike Bahre netted just his second goal of the campaign midway through the first half and Cauley Woodrow fired home his 17th before the break. Sheffield United loanee striker Ched Evans struck back in the 64th minute but a minute later central defender Harry Souttar received a straight red for a challenge on Cameron McGeehan, who soon made them pay by heading home the third. Fleetwood were not finished and Wes Burns headed home to make it 3-2. 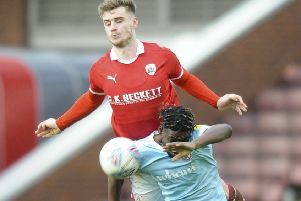 Barnsley suffered a major pre-match blow when central defender Liam Lindsay dropped out with a knee injury. Adam Jackson stepped in to partner Ethan Pinnock. Jordan Williams also replaced Dimitri Cavare at left-back and Bahre came in for winger Ryan Hedges from the starting XI in the 3-1 loss at Burton Albion. There was a South Yorkshire feel to the Fleetwood side which included former Rotherham goalkeeper Alex Cairns, ex Doncaster player James Husband as part of a three-man defence, former Sheffield Wednesday midfield man Ross Wallace and Blade and captain Evans. The visitors also included Nathan Sheron, nephew of former Barnsley striker Mike and on the bench was Harrison Biggins, the son of another former Red, Wayne. 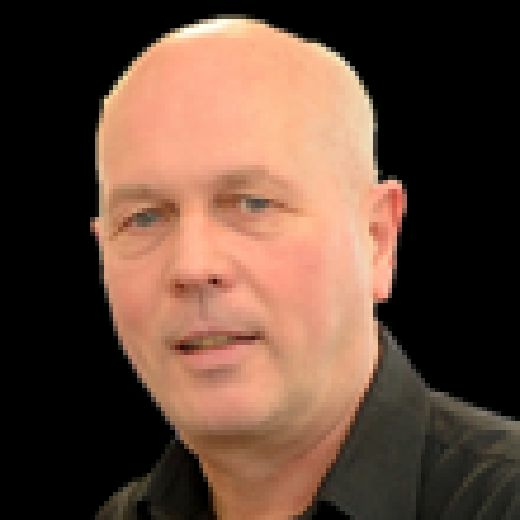 Williams was soon in action, robbing Evans as he tried to burst down the middle on the break. Leeds United loanee Lewie Coyle soon curled a shot from the edge of the area narrowly over and then Ashley Nadesan failed to get power or direction on his shot from out on the right after Adam Davies rushed from his goal to retrieve a long punt and lost control. However, the Reds struck in the 21st minute, Jacob Brown bursting down the right channel and hitting a low cross for Bahre to convert from inside the six-yard area. Alex Mowatt also hit narrowly off target with a rising angled drive before Nadesan fired into the side-netting for Fleetwood. It was 2-0 in the 34th minute when McGeehan’s shot from outside the area looped up off a defender and dropped into the are for Woodrow to fire past Cairns at the second attempt. McGeehan and Daniel Pinillos were booked for fouls before the break. It was a quiet start to the second half, neither side having made a change. Coyle went in the book for a trip on McGeehan in the 58th minute. Paddy Madden replaced Wallace in the 60th minute before Davies went down to his right to palm away a drive from Nadesan. 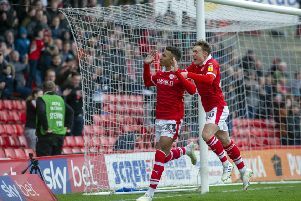 Barnsley did not heed the warning and Nasdesan again burst down the right channel forcing Davis to beat away his shot for a corner which Souttar headed down, allowing Evans to stretch out a leg and force the ball home in the 64th minute. However, a minute later, Souttar led with the arm as McGeehan waited for the ball to drop and caught the Barnsley player in the face to receive a straight red card. McGeehan drove forward, fed Mamadou Thiam down the left and headed home the resulting chip to make it 3-1 in the 70th minute. Davies twice punched clear under pressure but when Coyle sent over a deep free-kick, Burns headed it down and saw the ball nestle in the net as the Reds failed to keep it out in the 77th minute. Relief was at hand as Mowatt crossed from the left corner of the area and Brown ran in to net with an instep volley in the 79th minute to complete the scoring.